Method: In a tall glass , muddle 1 slice of fresh ginger. Then add 1 spoon of flower honey, 1 oz COURVOISIER EXCLUSIF, 1 oz of ginger ale, 1 spoon of flower honey and 1 dash of fresh lime juice. Mix using the bar spoon – fill half of the glass with crush ice, place 2 long slices of cucumber and then top with crushed ice. It’s delicious! 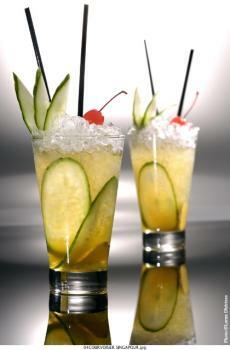 Garnish: Cucumber slices and a cherry. 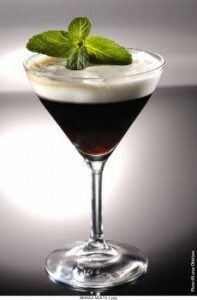 Method: In a mixing tin with ice combine 1 1/4 oz BRANCA MENTA, 1/4 oz BORGHETTI coffee liqueur and 1/2 oz of cold expresso. Shake vigorously and strain into a chilled martini glass. Top with MASCARPONE cream (I whipped it manually for 10 sec). Method: In a tall glass pour 1/2 oz of Black Berry Syrup add 3 fresh BLACK BERRIES and 4 fresh mint leaves. 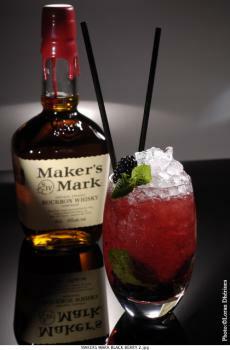 Muddle briskly, then add 1 1/4 oz of MAKERS MARK, 1 1/4 oz of CRANBERRY JUICE and ice. Mix with the bar spoon then top up the glass with crushed ice. Garnish: Fresh Black Berry and Mint Sprig.